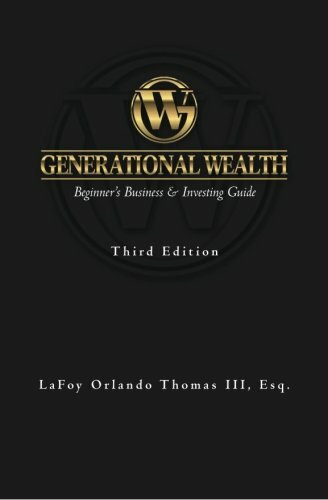 Updated with additional chapters, the third edition of Generational Wealth: Beginner's Business & Investing Guide is one of the most exciting and comprehensive business and investing guides ever published. Full of practical examples for gaining wealth, it is definitely a required reading for all aspiring investors and entrepreneurs. In an easy-to-read format, the book successfully covers economics, real estate investing, stock market investing, bonds, entrepreneurship, mergers & acquisitions, contracts, and more. True to its title, Generational Wealth is a business and investing guide for beginners and also includes a plethora of content for the professional investor and business executive. The third edition is a definite upgrade to the already-fantastic second edition, which was titled Generational Wealth: Business & Investing Guide to Building an Empire. Read the only book that is comparable to getting an MBA from Harvard and Wharton business schools.